Our family just returned from a visit to my in-law’s home near an artist community in northwest Arkansas. After enjoying a wonderful afternoon of shopping and a delicious meal at a local restaurant, our crew stopped by the grocery to grab a gallon of milk while the grandparents, who had driven separately, headed home to unlock the house. I ran into the store and quickly dashed out with milk in a paper sack and wallet in hand. As I approached our car, the bag disintegrated, the milk and my wallet went bouncing across the parking lot, and dollar bills went flying with the wind. Doubled over in giggles I looked to my family for help, but they were laughing even harder. I ignored them and the other shoppers playing witness to my clumsiness and rushed around to gather the milk and my money. As I jumped in our car, none of us could speak or breathe as we were brought to tears with the hilarity of the situation. 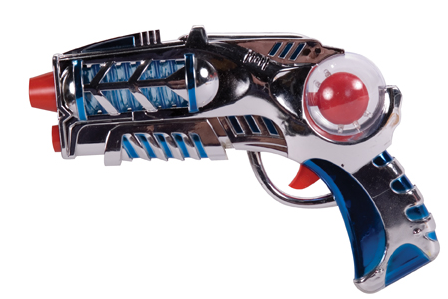 They finally explained that at precisely the moment my grocery sack collapsed, my son had shot me with his new gift from grandma, a Cosmic Blaster. Safe for children ages 3 years and older. Dangerous for mothers who forbid their sons from using them in the car.